Lodi, California (not to be confused with Lodi, New Jersey) is the place to grow Zinfandel. This particular example is evidence supporting that statement. 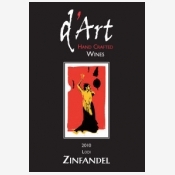 This zin offers big, juicy fruit on the nose and the palate. Nose is full of vanilla, butterscotch, cocoa, and red berry fruits. Palate is wide open, fruit forward with gobs of sweet raspberry, blueberry, and fruit compote, finishing with berry fruit and chocolate flavors. Acidity is mild, tannins are mild to medium. Alcohol is surprisingly low for a wine with so much fruit and concentration — there’s some heat, which is expected, but not so much that it takes away from the flavor. This wine was also reviewed by Wine with Lisa, Ellen On Wine, Drink Hacker, and James the Wine Guy. If you’ve seen other reviews, and/or have tasted this wine yourself, please let me know in the comments. This is a very pleasant, easy drinking wine, but I have to admit that at first it was a little disappointing. My problem is with expectations — for many wines, I have expectations. And for this wine, seeing Cabernet on the label, I expected firm tannins, bold acidity, good structure. In short, a big wine. I stacked up a lean filet mignon, broiled rare, to pair with it, and it fell on its face, turning into sweet grape jelly juice. However, once my expectations left, I tried it again the next evening. After 24 hours of breathing, and tasting it again without food, the wine showed much better. It has a spicy nose of vanilla, licorice / anise, cloves, wet earth, tobacco, bell pepper, black and red berry fruits — quite complex, and enjoyable to sniff. Similar flavors flood the palate, finishing with a good balance of tangy acidity and mild tannins. Refreshingly, there’s no heat at the end despite all the ripe fruit upfront. On its own, this is enjoyable and a wine I will drink again. However, to me, it’s not what I expect from Cabernet Sauvignon; I think it’s the tannins missing that make it incomplete for typical food matching. Don’t get me wrong — it will match with food, but go leaner than you would normally with a Cab. Instead of beef, go with barbecue chicken or roast turkey; I might even try this with a strongly flavored fish dish (crispy salmon? blackened catfish?). This wine was also reviewed by StonedWino (2008 vintage), Gabe’s View, Vine Geek, Dallas Wine Chick, and At First Glass. South African wines have always had a special place in my heart, as they seem to me to be the forgotten stepchild in the family of fine wines of the world. Go into any wine shop — even a very good wine shop — and you will have a hard time locating the “South Africa” section; in many cases, it may not exist. If you do find it, it will probably consist of one shelf at most. More likely, it will be a half-dozen bottles shoved to the very corner of a bottom shelf that also includes random labels from New Zealand and Australia. It’s a shame, really, because most of the wine coming from South Africa to the USA is very good, but it has no marketing behind it, and few people talking about it. But then, perhaps that’s your advantage; if more people were excited about South African wine, the prices would be much higher. Many consider the wines of South Africa to be “New World,” but that’s kind of a misnomer, considering that vineyards and winemaking has existed there since the 1650s. The history is long and complicated, and we’ll discuss it further another day. To be unfairly brief, today’s South African wines are an intriguing mixture of both Old World and New World styles — a reflection of that history. One example of those two worlds colliding — in a good way, is Thelema Merlot. Thelema is a winery situated in mountains of the same name, surrounded by towering oak trees, cackling peacocks, and lush vineyards resting between 370 to 640 meters (1200 – 2000 feet) above sea level. If you can ever visit, the view is breathtaking. In the meantime, you can experience the wine. Open, ripe, mature, almost jammy aromas of earth, black fruits, blue fruits, leather, tobacco. Also a hint of smokiness, almost like Liquid Smoke. I am loving this nose, which exhibits typical Merlot earthy and slightly bell-peppery character and is generously expressive. In the mouth it has juicy, jammy ripe black and red berry fruit flavors. Again, generous, and also complex. I keep wanting to say jam, because that’s what’s filling my mouth — what resembles a thick flavor of boysenberry and currant preserves. There is also some spice here, but it’s not overly oaky by any means. Finishes with puckering acidity and ripe, medium tannins. A bigger wine than I expected for its sub-$30 price tag. New World style. The 2007 vintage is likely unavailable at this point, which does you no good unless you have a few bottles of this waiting in your cellar. If that’s the case, I suggest you uncork it and enjoy with a beef or lamb stew or a really robust burger — i.e., one made with a mix of short ribs and/or ribeye, which seems to be all the rage with gourmet burgers these days. With that hint of smoke, it would also go well with a smoked cheese and smoked meats. Disclosure: I received this wine as a gift from friends. See Ken Hoggins’ review of this wine at Ken’s Wine Guide.